Wifetime of Happiness thanks you for your support! No, not "authentic" Peanut Sauce . 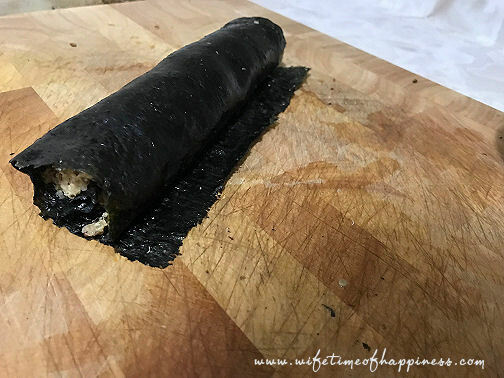 No, not actual "sushi". Dontcha just hate when we have to be sooo PC haha. Anyway friends, I hope you'll love these little rolls as much as I do!! Lime Juice – I use about 1 tsp because I love lime! 2) Once cooled, thoroughly stir in Peanut Butter, Garlic Powder, Tamari and give a generous squeeze of lime juice. Taste mixture and adjust if needed. 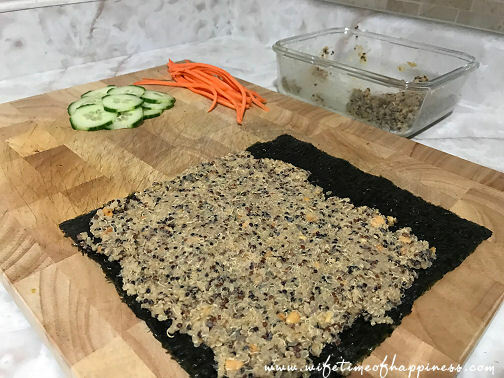 With the rough side up (facing you), lay the nori sheet on a flat surface – I roll mine on a wooden cutting board. 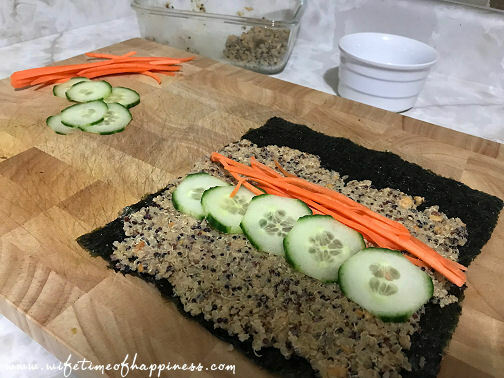 Flatten and spread the quinoa out evenly, but not right to the edge (as shown). Don't be nervous, just be gentle. There is definitely no need for all that fancy gear you may think is involved. 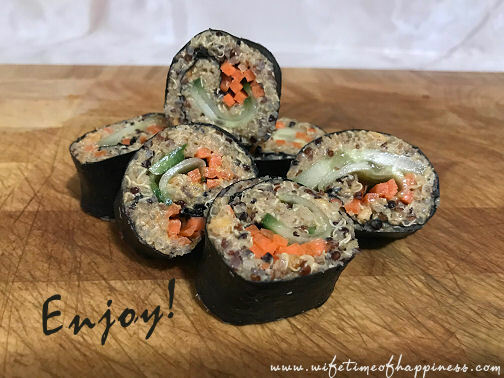 Your mixture is sticky, thus being the magic in "rolling made easy". 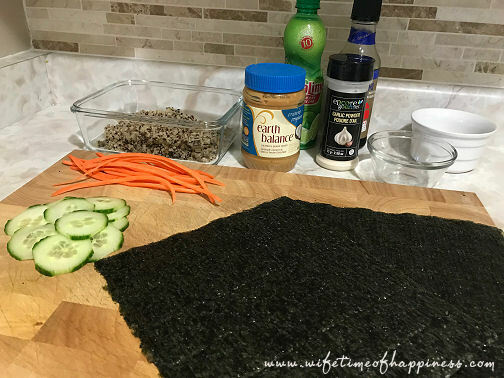 Your first 'turn' of the Nori sheet should take you just before the veggies. Pull back on the sheet, keeping it nice and tight, then continuing the rolling process. Simply dip your fingers in some water and run along the seam – This will seal it up! 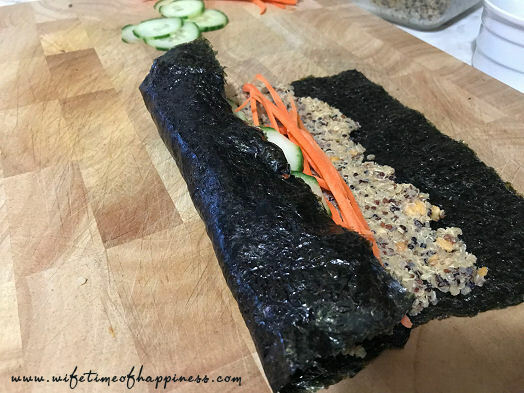 Slicing: The best way to slice your sushi roll is with a very sharp knife. I actually find that the boning knife from my knife block works perfectly. Wiping down the blade and running it under hot water after each cut is the secret to achieving smooth slices. 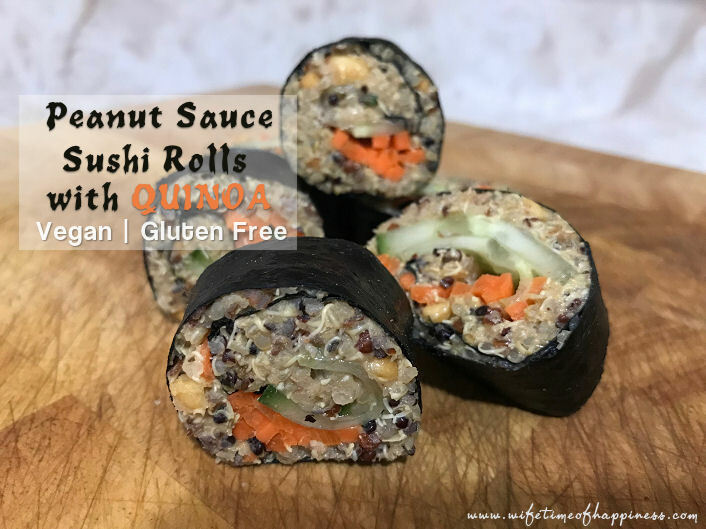 And there you have it – Delicious and filling Peanut Sauce Sushi Rolls. Thanks for stopping by and I hope you'll enjoy these as much as I do!